Hiphen Solutions Flap Barrier (speed gate) is used for people access control in public passages. The mechanical part of the flap barrier contains an emergency control device, which allows automatic opening of the two wings in case of power failure; when power supply is resumed, the two wings will be reset automatically. Hiphen Solutions offers a wide range of flap/Swing barrier solutions which has pleasing esthetics to suite the taste of our prestigious customers with different configurations. 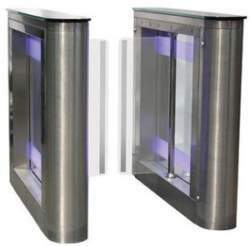 Our flap barriers are made out of high quality 304 stainless steel materials with brushed finish, They can be installed in all building conditions and are capable of providing a complete access management solution for the control entry & exit passages of the buildings. Besides, we do provide complete integrated access solutions to control these flap barriers with customized visitors & members management software which can be centrally controlled & monitored or of standalone type.